He was speaking at the commemoration for fallen ATO pilots. Ukrainian President Petro Poroshenko has said that martial law may be imposed and mobilisation will be announced should the situation in eastern Ukraine and Russia-occupied Crimea escalate. "In the event of the exacerbation of the situation in the east and in Crimea [...] we will have to impose martial law and order mobilisation," UNIAN quoted him as saying at a ceremony commemorating pilots killed in the ATO zone, which was held in the town of Brody in Lviv Region. Jointly with its international partners, Ukraine "will be able to force the aggressor to sit at the negotiating table, force it to comply with its obligations in the Minsk process, and return to the Normandy format," he said. 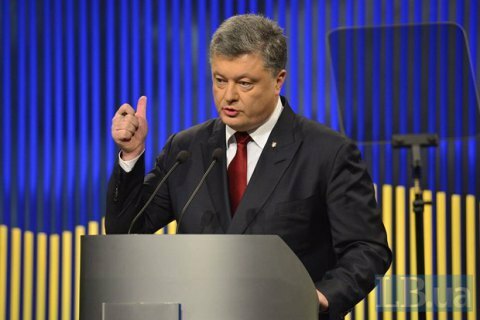 Since the beginning of 2016, over 45,000 Ukrainians have concluded contract to serve in the army, the president recalled. "They spoke about contracts in the army before us – but nothing was done. As of today these military volunteers who have concluded contracts have let me, as commander-in-chief, not to announce new waves of mobilization," he said.